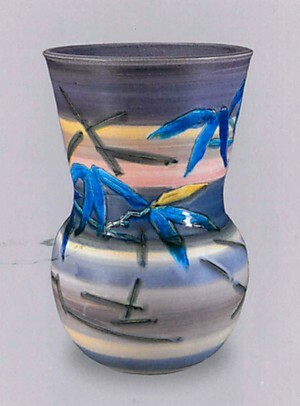 During the period of the late Showa era and the present time, having already established its brand name as traditional arts and crafts, Kutani ware started to produce works appling elements of the modern art in it as arts rather than crafts beyond its boundary. The fact that Kutani ware with a variety of designs adapting the new lifestyle has been produced is another characteristic of Modern Kutani. In Kaga city, the artists have carefully inherited the tradition of Ko-Kutani since the Daishoji clan period. KITADE Tojiro and KITADE Fujio, father and son, lead the modern Kutani movement. 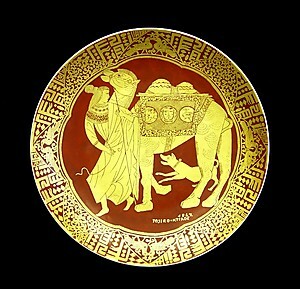 They established their own style with consolidating curved figures and exotic designs of the Middle East based on the traditional overglaze enameling techniques. In Komatsu city (next to Kaga city), TOKUDA Yasokichi 3rd having established the color gradation technique in overgraze bright enamels. YOSHIDA Minori were able to produce the porcelain with underglaze golden decoration to install the gracious luminosity. They were received the official recognition of being living national treasure from the government of Japan.